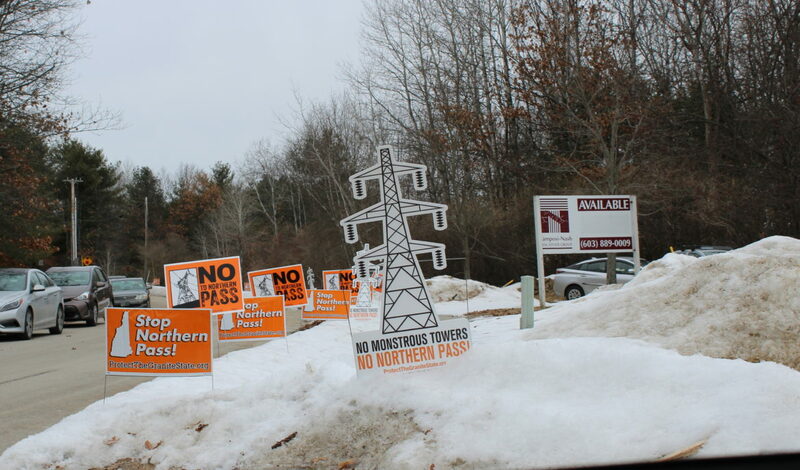 Anti-Northern Pass signs lined the street leading to 49 Donovan St., in Concord where the state's Site Evaluation Committee began deliberating the fate of Northern Pass in January. Sign up for InDepthNH.org’s free weekly newsletter here. Check out our Northern Pass coverage here. CONCORD — The Mass. Office of Energy and Environmental Affairs will “monitor and evaluate” the Site Evaluation Committee’s “shocking” decision Thursday to deny Northern Pass’s application to build a controversial 192-mile transmission line from Pittsburg to Deerfield. Northern Pass’s bid was recently selected as the sole proposal of 46 to provide 1,200 megawatts of renewable electricity for the Massachusetts Clean Energy Project and had two months to negotiate contracts with that state’s utilities before going before regulators. In announcing the selection, Massachusetts energy officials said one of the key reasons was Northern Pass’ ability to begin operations in 2020, at least two years earlier than other proposals. “Massachusetts’ recently selected clean energy procurement project remains conditional on necessary siting approvals and EEA will continue to monitor and evaluate developments in New Hampshire as the administration works to ensure a clean and affordable energy future that progresses toward greenhouse gas emissions reductions,” said Peter Lorenz, Mass. EEA Communications Director in an email. 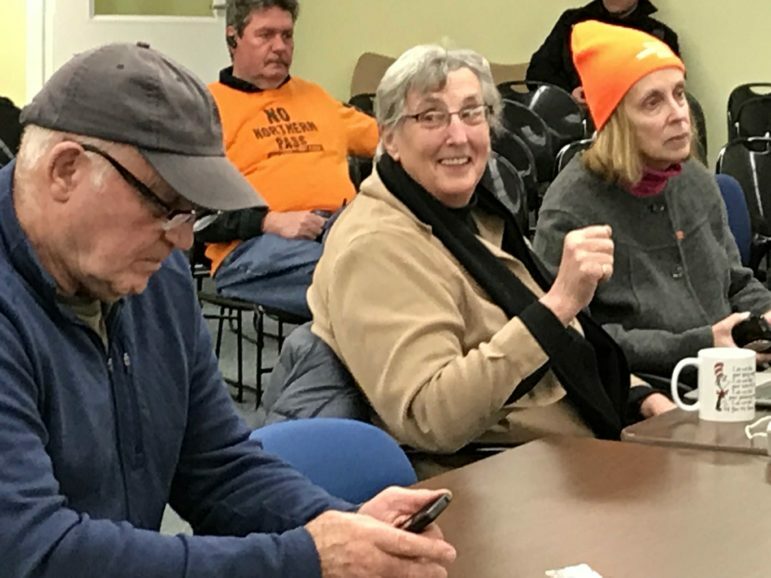 As opponents of Northern Pass celebrated Thursday’s unexpected vote 7 to 0 to deny Eversource Energy/Northern Pass’ application, reaction was quick from the business community and opponents. The SEC members said the project does not meet the criteria that it would not negatively impact orderly development of the region. The decision ends eight years of controversy and opposition since Eversource announced in 2010 the plan to bring Hydro-Quebec electricity to the New England grid. Jack Savage of the Society for the Protection of New Hampshire Forests, said the committee rejected a proposal that has had fundamental flaws since the beginning. “That is why they could not make their case,” Savage said, noting the committee clearly listened to the people impacted by the project and local officials along the line, most of whom were opposed. “In identifying the multiple reasons behind their conclusion, the subcommittee members discussed exactly the right issues: undue interference with land use, property values and tourism, and inadequate outreach to communities,” said Savage. 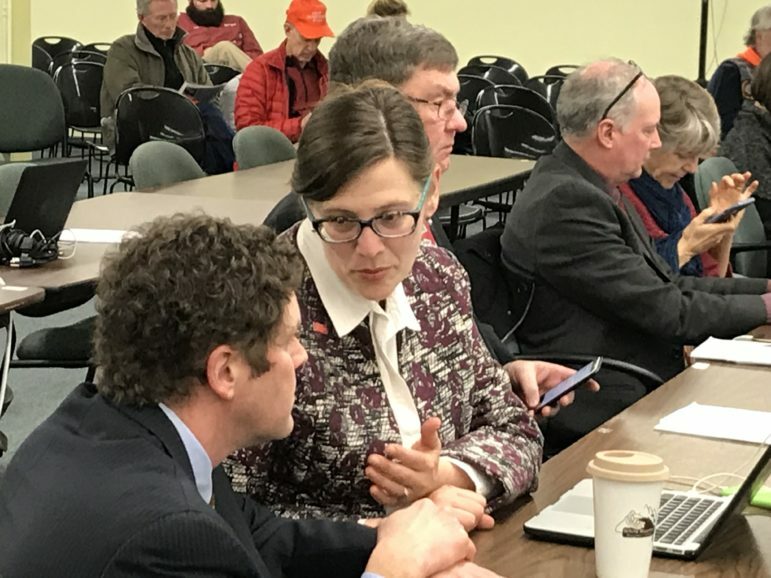 Society for the Protection of New Hampshire Forests attorneys Amy Manzelli, right, and Jason Reimers are pictured in the foreground at Thursday’s session along with Will Abbott, Jack Savage and Jane Difley. Martin Murray, spokesman for Northern Pass said: “We are shocked and outraged by today’s SEC outcome. The process failed to comply with New Hampshire law and did not reflect the substantial evidence on the record. As a result, the most viable near-term solution to the region’s energy challenges, as well as $3 billion of NH job, tax, and other benefits, are now in jeopardy. “Clearly, the SEC process is broken and this decision sends a chilling message to any energy project contemplating development in the Granite State. We will be seeking reconsideration of the SEC’s decision, as well as reviewing all options for moving this critical clean energy project forward,” Murray said. Opponents of the $1.6 billion project told a different story saying state regulators made the only decision they could under the state law. Cathy Corkery, chapter director of the New Hampshire Sierra Club, said: “The people of New Hampshire rejected the unreasonable burden of international transmission lines proposed by Eversource and Hydro-Quebec. 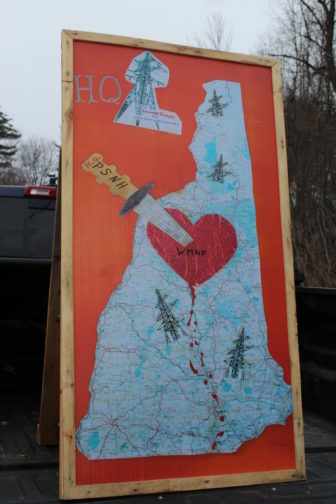 “…New Hampshire Sierra Club would like to recognize all of the people who stood up against the Northern Pass in New Hampshire and our dear friends of the Pessamit Innu First Nation who opened our eyes to the destruction of their land and culture by Hydro-Quebec. Truth does not fall to injustice,” Corkery said. 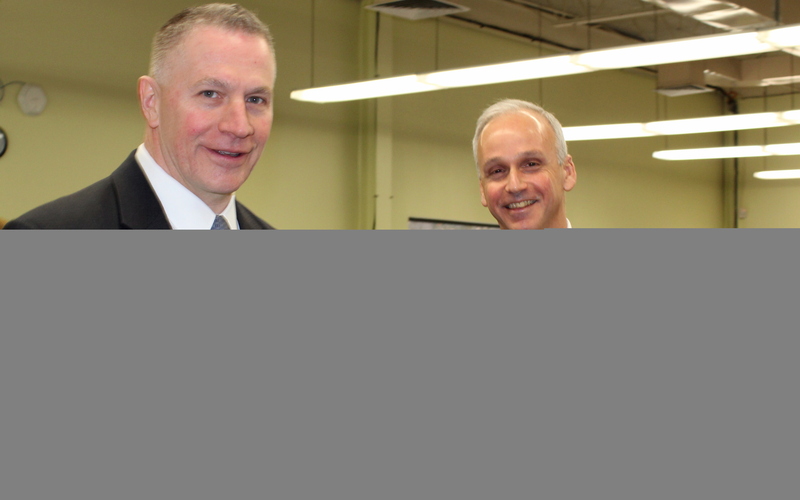 Eversource NH president Bill Quinlan, left, is pictured with Northern Pass attorney Barry Needleman at Tuesday’s deliberative session. The project had the backing of business organizations and large companies as well as labor unions whose members would have helped build the project. Michael Skelton, president and CEO of the Greater Manchester Chamber of Commerce, said the SEC decision was shocking and disappointing. “The SEC process has been bogged down by delays since its start and the sudden dismissal of the project further highlights the flawed nature of this process,” Skelton said. Sign out front of 49 Donovan St., Concord, on Tuesday where hearings were held on Northern Pass. Opponents of the project claim it would permanently scar the face of the state, hurt the state’s economy, lower home values, destroy sensitive environments and disrupt the lives of those along the route. Eversource Energy/Northern Pass has 30 days after the committee issues its written decision to ask for a rehearing or to reconsider its vote. If that is granted, a rehearing would be held before the SEC, said attorney Michael Iacopino, but if it is denied, Eversource would have 30 days to appeal the decision to the Supreme Court, which would determine whether it was unreasonable or unlawful. Depending on the court’s decision, Iacopino said, the SEC could rehear the case and may have to go back to the beginning and start over again. “We would do what the court says,” he said. *And issuing a certificate will serve the public interest. The SEC earlier this week concluded Eversource has the financial, technical and managerial capability and experience to construct Northern Pass. From left at Thursday’s deliberative session on Northern Pass in Concord are opponents: Dr. Campbell McLaren, Susan Schibanoff and Judy Reardon. Reardon represents Protect the Granite State. SEC chair Martin Honigberg said there were “a lot of holes” in the applicant’s arguments that the project would not negatively impact property values, tourism and recreation, businesses, land use, and community services and infrastructure. But, he said, the energy cost savings which would help the state’s economy are very small. Way referred to the 52 miles of buried line from Bethlehem to Bridgewater. In the morning, Bailey said under the statute the committee has to consider the views of municipalities and officials. In other projects before the SEC, the views of municipal officials have been taken into account, she said, but generally they were more positive than in this case. The committee initially voted 5-2 to deny the project, but the no votes, Honigberg and Patricia Weathersby said they were voting to continue deliberations and would have voted to deny the application, so the motion was reconsidered and the vote to kill the project was unanimous. Thursday was the third of 12 scheduled deliberative sessions. Instead of meeting through the rest of February, the committee voted to adjourn Thursday and go home. The seven-member committee said earlier in the day project developer Eversource failed to meet its burden of proof that the project would not negatively impact the orderly development of the region, one of four criteria that must be met for approval. After the straw vote, the committee continued to review the evidence, but after lunch Vice Chair Kathryn Bailey moved to deny the application because, she said, the committee could not approve the application. Nancy West contributed to this report.